For years, many Mac app developers have had to design their own ways to get your attention. The open-source project Growl helped save those developers from reinventing the wheel by creating a more general notification system supported by lots of apps. But with Mountain Lion, a true systemwide notification service will finally arrive when the Mac OS X update ships this summer. Like its counterpart on iOS, this new service is called Notification Center. With Notification Center, Mac developers now have access to features much like those already found in iOS. Alerts and notifications appear in the top right corner of the screen in a small bubble that looks an awful lot like a Growl notification. Notification bubbles remain there for five seconds, and then slide off screen to the right. Alerts, on the other hand, remain on-screen until you click on the Show or Close (or in the case of some alerts, Snooze) buttons. In iOS 5, you see all your recent notifications by pulling down from the top of the screen to reveal Notification Center. In Mountain Lion, the Notification Center list is a narrow band that lives just to off the right side of your screen. You can reveal it either by clicking on the new Notification Center icon at the far right of the menu bar, or by swiping with two fingers starting at the far right edge of the trackpad. Either way, your Mac’s entire screen will slide to the left, revealing a list of what’s been trying to get your attention recently. There’s also a new Notifications pane in the System Preferences app, analogous to the Notifications submenu in iOS’s Settings app. From here, you can choose which apps appear within Notification Center and how their alert bubbles behave. You can choose, on an app-by-app basis, whether you want any notifications at all, and if you want them to be of the five-second or visible-until-you-click variety. You can also choose how many notifications for an app to display and choose whether to also play a sound as part of the alert. Different apps will handle notifications in different ways. 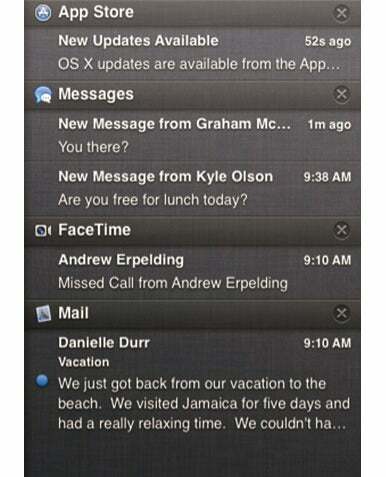 Apple has built notifications into several of its apps with Mountain Lion. Of course, iCal uses Notification Center for all event notifications. Messages sends alert notifications when you receive a new message. Reminders sends you reminders. FaceTime warns you about missed calls. Game Center tells you about friend requests and game invitations. The App Store app tells you if there are updates available. If you add your Twitter account to the system, you can receive notification of Twitter direct messages and mentions. Mail lets you choose how you want to be notified about new messages. And Mail now has a new option in the General tab of its preferences: New Message Notifications. You can set it to display notifications for all messages that appear in your Inbox, for all messages from people in your Contacts, for mail in a specific Smart Mailbox, for mail in all mailboxes, or for messages only from a VIP contact. The VIP is a new concept in Mail, which lets you tell Mail that certain people are special. After you do that, Mail can send notifications only when you receive a new message from someone you’ve marked as a VIP. You also should be able to use Mail Rules to specify exactly which messages merit a notification.